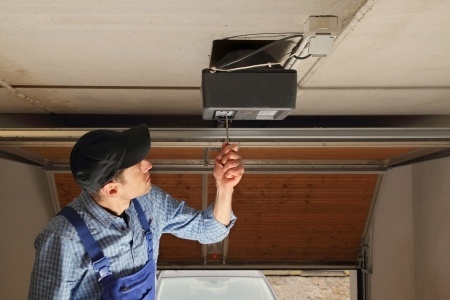 Michiana Garage Door Services installs an emergency garage door release on all their garage or other overhead doors throughout the Michiana region. They can show you where t is if you don't know already know. You never know when you're going to need it. A door installed by Michiana Garage Door Services rarely malfunctions. If it does, however, (or if you have an overhead door that was installed by someone else) they provide round the clock garage door repair. The emergency release is there to provide assurance neither you or your children will ever be locked in or out of the garage. The MGDS team's commitment to providing garage door repair 24/7 means the cause of the problem will be remedied immediately. You can't schedule when something will go wrong. If you need to get in or out of your garage at 3:00 a.m. on a Sunday morning you don't want to wait until the following Wednesday to have it fixed. Michiana Garage Door Services knows this; and that's precisely why they are committed to providing 24 hour garage door repair in Mishawaka, IN. When it comes to garage and other overhead doors you want to use a real professional. Don't leave the job to your neighbor's uncle who thinks he's some sort of super handyman. Instead, have someone from Michiana Garage Door Services come and take care of the problem. You won't find a better garage door fixer. Now here's the good news: Not only are they great at what they do, Michiana Garage Door does it at a fair, affordable price. When you need to do a search for garage door service near me you're going to want to choose Michiana Garage Door Services. They're the best overhead door repair option in the whole Mishawaka, Indiana region. Oh, and by the way, Michiana Garage Door doesn't just service your garage and other overhead doors. They also install them. It's gratifying, but not surprising, to find out they're as good at installing the doors as they are at servicing them. In fact Michiana Garage Door services is widely recognized throughout northern Indiana and southern Michigan as the best of all local garage door installers. If you've read this far you know some of the things that make this company the best at what they do. They offer excellent service whether repairing or installing your garage door. Their commitment to reliable customer service is demonstrated by their round the clock availability. Further evidence they're on your side is found in the emergency releases they include with every overhead door and their firm commitment to making sure you know how to use it. Think you can't afford an automatic garage door opener? Think again. Besides, excellence, reliability, availability and a concern for your comfort and safety Michiana Garage Door Services does their work for fair and reasonable prices. Contact them today to set up a mutually agreeable appointment time.